Last week, the Meerkats had lots of fun learning about capacity. We discussed the words full, empty, half full and quarter full. 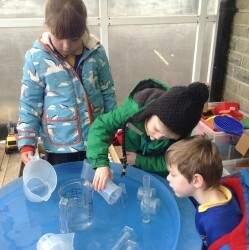 The children worked in pairs to fill the different containers and discuss how much water they held. They then compared different sized containers and explored which ones held the most and least amount of water.